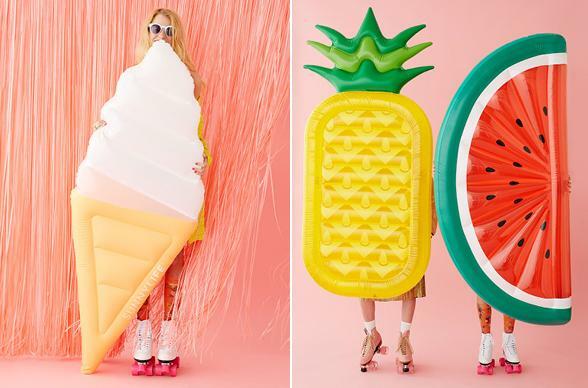 The 25 Coolest Pool Floats for Your 2016 Summer Shindigs! Top ten summer jams? "There must be something in the water.." Singer Coleman Hell sure is spot on. 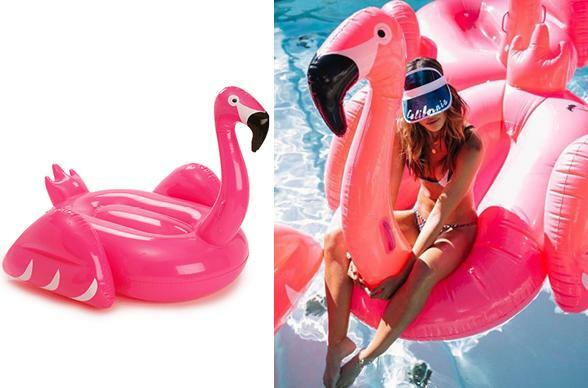 Whether you're dipping a toe in a lake, river, ocean, cenote OR pool, we've got THE coolest ways to "all float on ok..." In honor of one of our most popular posts from last year, we're back with the 2016 Hottest Pool Party Floats! There are some new goodies on the pool fleet scene. We looked to the FUN experts AKA ban.do, as they're bringing these babies back in a big, big way ... the theme? Animal and food everything. Also known as... our Instagram feed. (Embarrassing). Oh and emoji's are making an appearance this year (insert excite face). 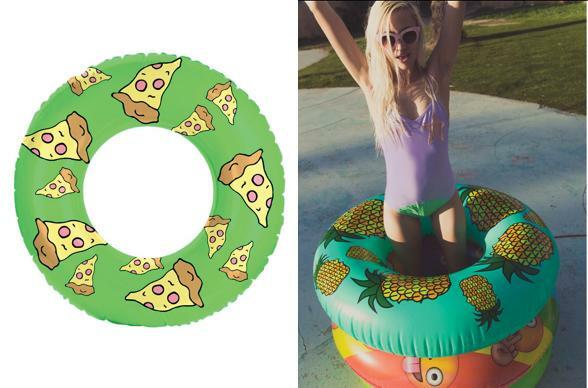 So gather up your besties, grab an inflatable gummy bear, pizza slice or donut and make a seriously cool splash at your next pool party. Pools, lakes, lazy rivers, watering holes and an oceans everywhere. Don't EVER let anyone tell you that you can't ride a unicorn. This magical lady is over 8ft long AND and you can inflate it with a hairdryer. Now that truly is magic. $99 Buy it here. 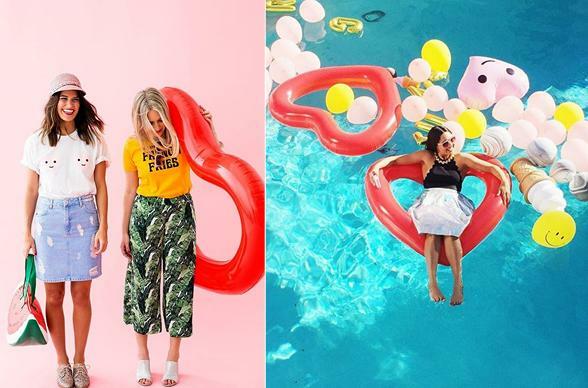 If you're dead-set on giving your heart away this summer... make sure it's inflatable and in the hands of someone who'll treat it reaaaaaal careful-like. Our recommendation? Besties. Always besties. Buy em' here. What's cooler than a gold heart BFF necklace? 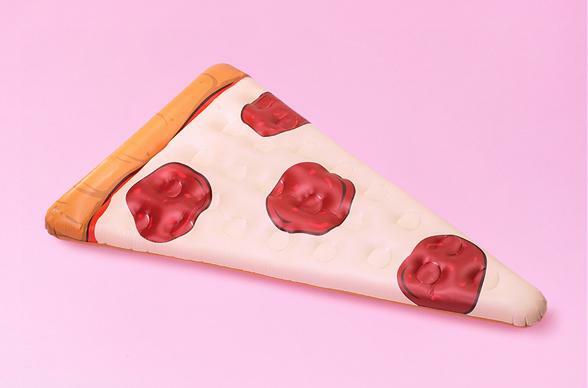 Each one of you and your gals owning a piece of this pizza pie. Treat yo 'self to a 5' foot long slice, minus the guilt. Now that's amore. $35.00; Buy it here. Hello 80's seashell vibes. "I sell seashells by the seashore" turns "I float on seashells anywhere I darn-well please which requires me to do absolutely nothing." Winning. PLUS did you see the drink holders? Check it out here! Ice Cream, Watermelon AND Pineapples, oh my! Which way will you sway? An ice cream float (get it?! ), or will you go juicy fruit style with these pineapple and watermelon dreams? We suggest an ice cream float with fruit toppings. Layer it up ladies and gents. Buy it here and here. We're bananas for you, let's never split. You can bask in the sun, banana split style. 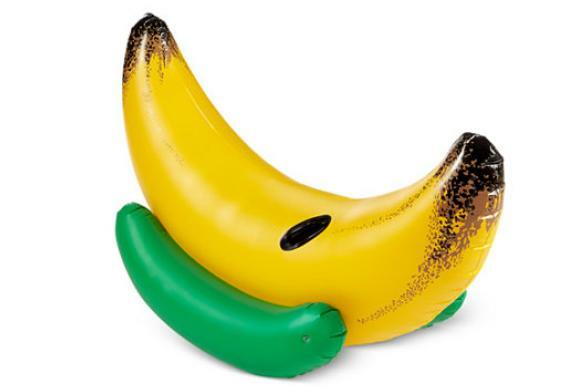 Argh.. so many good puns with this one, PLUS all banana float owners can blurt out "BANANA!" Minions style. $40; Buy it here. The grown up version of our favorite teddy bears we had as little teeny boppers. This adorable red teddy is 5' tall, inflatable and very huggable. Float on. $30.00; Buy it here. To quote the music group, House of Pain - "PAC it up PAC it in, let me begin! I came to win, battle me that's a sin. ... Jump around, jump up and get down." 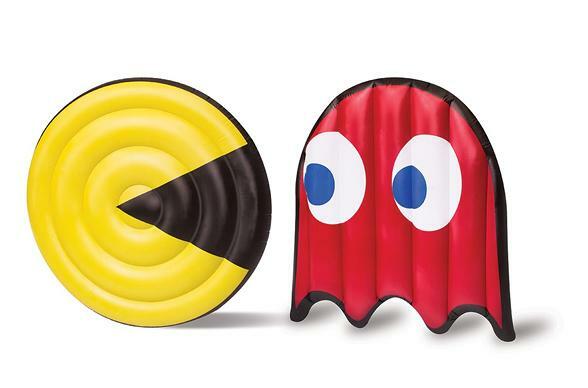 - The perfect lyrics to sing as you do the ultimate pool party pac man game. $40.00; Buy it here. 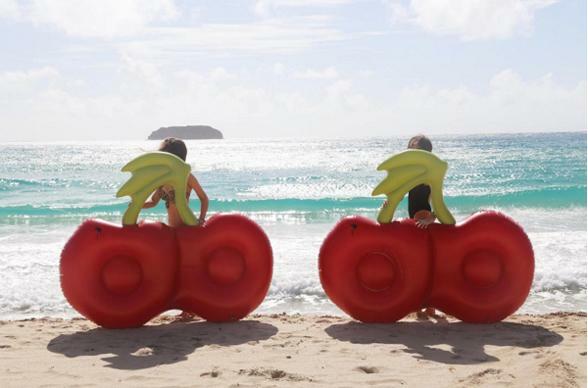 "Can't stay at home, can't stay at school..." So head for the pool with your very own ch-ch-ch-cherry bomb.com (float). This GIANT cherry float is over 6' in length! 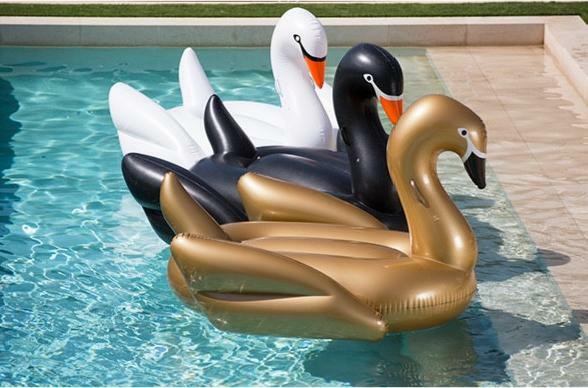 $79 gets you the cherry on top of your pool float fleet. 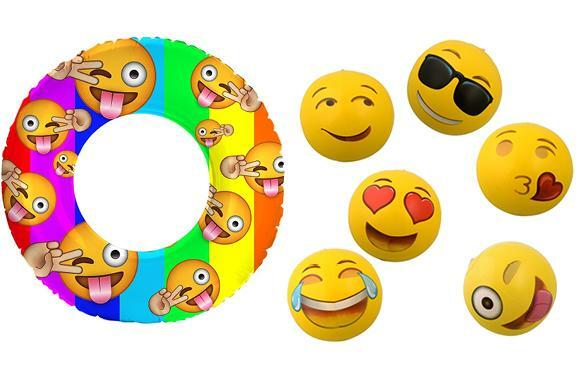 Instead of volleying a flurry of texts, serve up your feelings with these emoji beach balls! Tag your hottie crush with a pair of heart eyeeeez and pass your funny friend a little "LOL" face. If that's too much work, just float on a silly winky tongue-out face, your friends will get the picture. Literally. 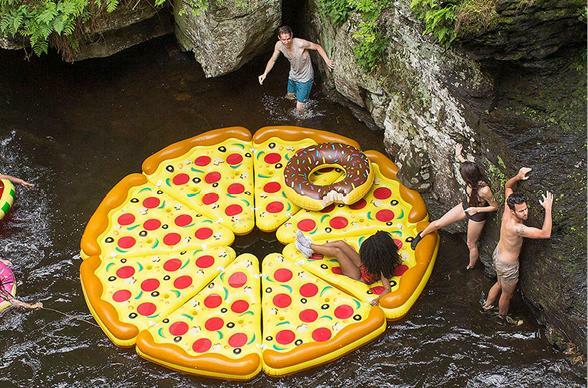 Grab your besties and each buy a slice for the yummiest looking floatilla we've ever seen. $48 a slice Buy it here. 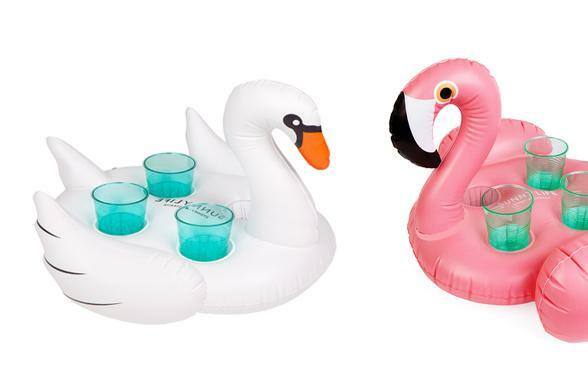 Inflatable swan and flamingo drink holders, *gasp* *faint* *swoon* THE CUTENESS. Lazy rivers everywhere are waiting for you. This puppy, er, swan holds up to 4 drinks. Even swans have #SquadGoals. Fire up your Insta feed with this black, white and gold trio. Buy the 3 pack here. 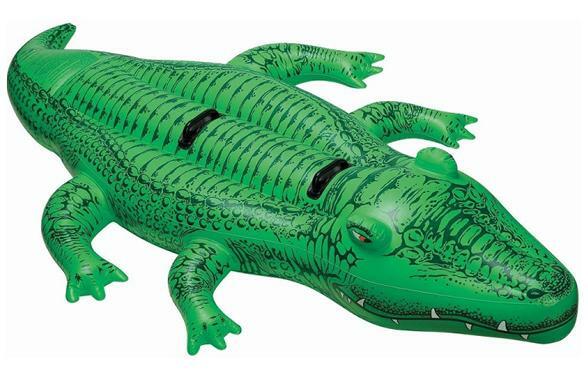 The OG - "original gator" of the pool floats. Buy it Here. In the words of Adam Sandler as Billy Madison (one of the great cinematic icons of our time) "Stop looking at me swan." 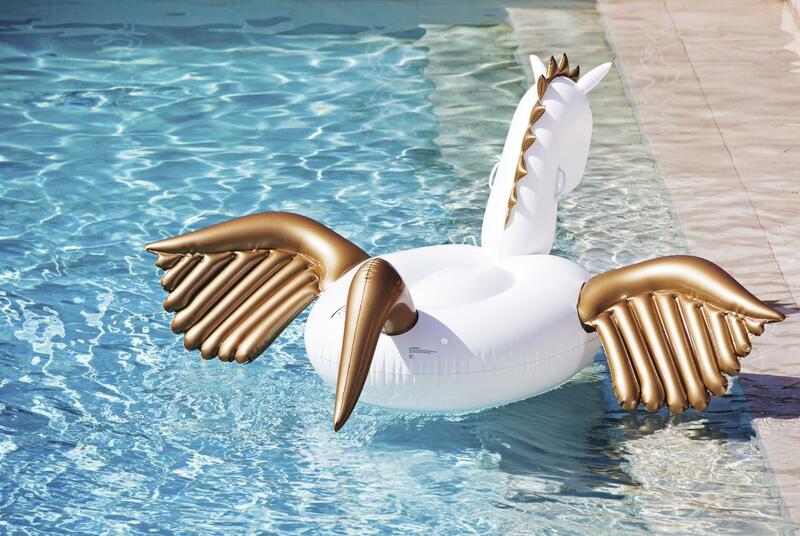 The Pegasus by FUNBOY is our new fave float. For $99.00, one of the best known creatures in Greek Mythology is brought to life for your lounging pleasure. Command the U.S.S. 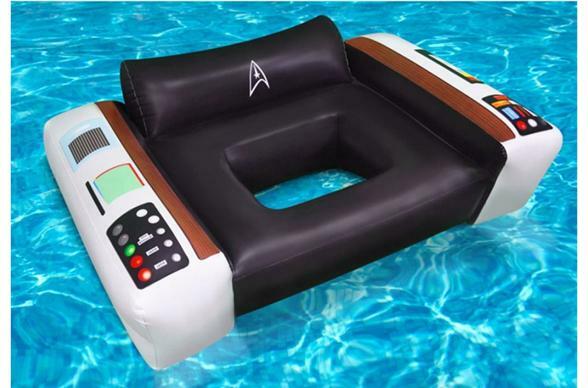 Enterprise from the comfort of your pool in this inflatable replica of Captain Jamie Tiberius Kirk's Captain's Chair. The star command is almost four feet wide, meaning you've got plenty of room for your crew. $55.00; Buy it here. 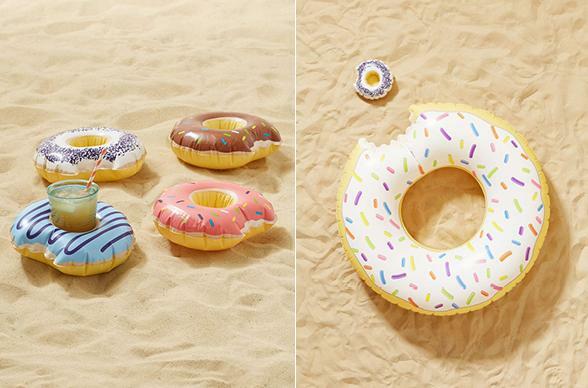 So many goodies from Sunnylife, we simply can't choose. Let's just get 'em all. Buy a float fleet here or here. Ain't no party like a pizza with pineapple party. Get your Simpson's cartoon vibe pizza float and layer it right up with a pineapple one. Stack 'em like you stack your rings. $30; Buy it here. Imagine a pool party. 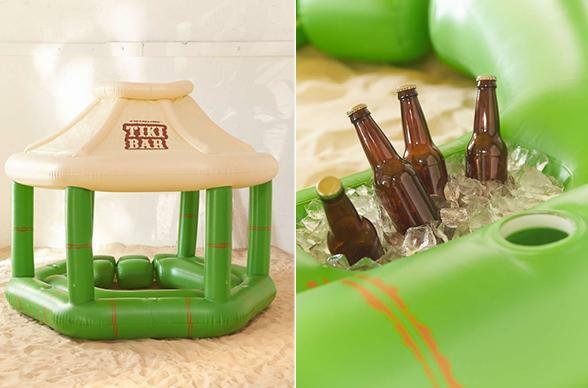 Now imagine a party with a tiki bar floating in the middle of the pool that actually holds ice, beer and cocktails. You have officially turned your home into the stuff legends are made of. $200; Buy it here. Yes, yes we totally agree that Paris is always a good idea. We also agree that champagne is always a good idea. Don't worry coffee, we think you are always a good idea too. But you know what is really a good idea in the summer? Flamingos. They should not be limited to retro stir sticks and lawn ornaments. They deserve to share the inflatable spotlight glory too. $99; Buy it here. If you're the competitive type, why not take this beloved American summer & frat house pastime into the pool? 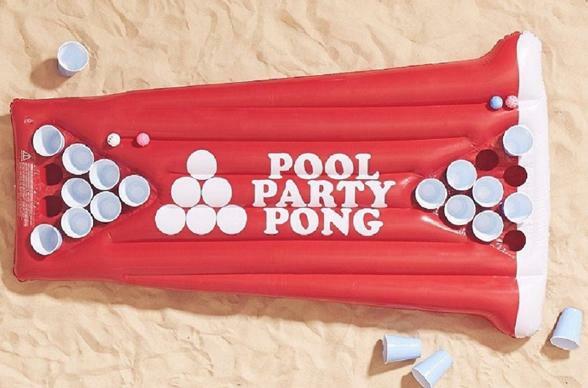 Red Solo Cup Pool Party Pong Pool Float - stay cool and play beer pong in the water! "Cotton candy sweet to go.... lemme see that tootsie roll." 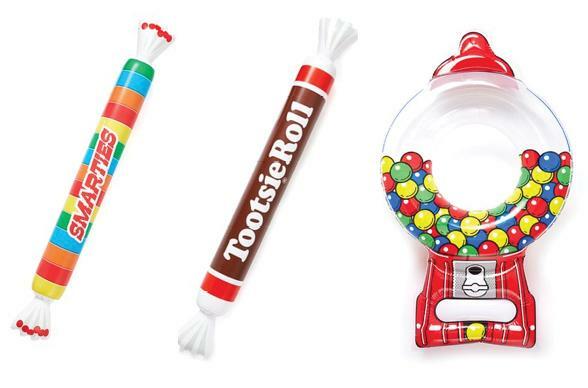 For a sugary sweet pool float fleet, stock up on this giant gumball machine , giant smarties pool float and tootsie roll pool noodles. 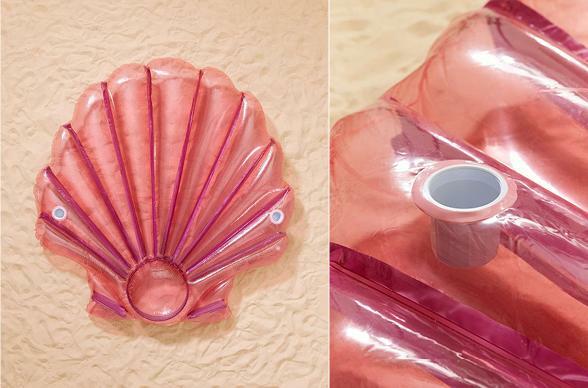 Also known as - all the Halloween reject candy made super cool... for the pool. 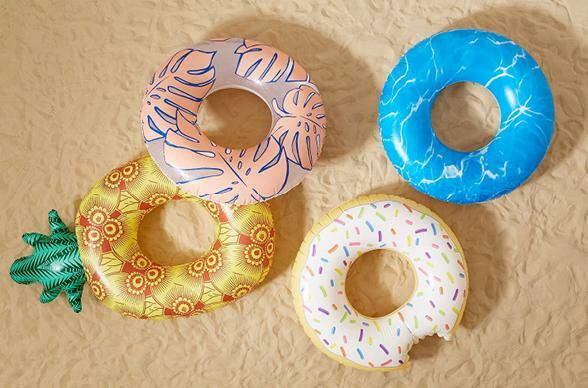 Pineapple, Tropical, Donuts oh My. Are inflatable birds and food not your jam. 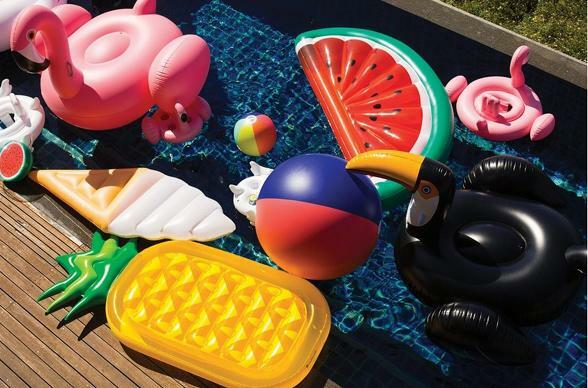 Keep it simple yet still kick your pool party game up a notch with a crew of patterned pool floats. Buy it here. What would a pool party be without a friendly little game of hot dog joust? $35; Buy it here.